So apparently, it takes 600 hundred hours to learn Spanish. Six Hundred?!?! Where am I going to find that kind of time? I can barely find 1 hour, let alone 600. So what if I want to learn Spanish fast? I have been learning Spanish for 6 years. I’m willing to admit that it takes time. Yes, a lot of time. And what’s worse, the long hours of study aren’t easy hours. It’s not like sitting down and watching Television for an hour. You have to focus. You have deal with negative thoughts. I don’t feel like I’m a language person. I have failed in the past. I will probably fail this time. I’m too afraid of making mistakes. I hate making mistakes. Who loves them? Who likes to feel like a bumbling idiot all day? It’s bad enough feeling like an idiot in my first language. I don’t need that feeling guaranteed in my second. It sometimes feels like my brain is sending me mixed messages. On one hand, I really want to learn Spanish. And I want to learn it straight away. Then on the other hand, I often indulge in distracting thoughts of quitting. What is going on with this stupid brain? Why the opposing thoughts man? What you are you doing to me? Get it together. It’s so exciting at the beginning. You have a feeling of optimism and potential for the future. You daydream about all of the fun you are going to have with your second language. You think of the people you are going to meet and the adventures that are possible. But, the problem is it gets hard. It’s not easy to learn a language. Well, at least to get to a good level. It is possible to learn how to make a food order in a cafe in an afternoon. But to be at a level where your can converse about difficult topics and share ideas, you need long periods of focused attention, love and care for your Spanish. The question is, can you handle this drawn out process? Do you tend to give up early? How does sitting with discomfort for long periods of time usually go with you? The thing is, if you don’t find a good system for learning Spanish, you risk failure. You need find a system where you will do the work that you need to do to get the job done. Not only that, but you need a system that will help you get there faster to increase your chances of success. If you can’t find a good system, you will fall short of your goals. If you lack a process for handling road bumps, chances are that you will never achieve what you set out to do at the start. And that is a tragedy. What would it be worth to you to discover a system that could help you get there fast? 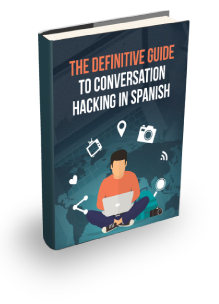 There are systems out there that can help you learn Spanish faster, but we first need to look at a few fundamental ideas. Meta is one of my favourite ideas. There is something about the philosophy of it. I find it fun to sit and ponder Meta loops. If I were getting Meta on this paragraph, I would say that I’m explaining Meta by getting Meta on the explanation. And so the loop continues. The term implies an information loop or self-analysis of the original idea. The most common example of Meta is meta-data. Meta-data is data about the data. And, of course, you need data about the data to truly analyse the data. Once you have a helpful set of meta-data you can start making decisions about the data. You can start taking action on the data. Actions such as organise it in certain ways or extract information to help you take action in other areas. The reason it is so important is without meta-data you could be overwhelmed by too much data. You could misinterpret certain areas of the data. Or you extract information that is misleading. Understanding the idea of Meta is not only fun, it helps you go deep to be more effective. It helps to take a step back and see the problem from a higher vantage point. We sometimes have the issue of being too close to the problem. And sometimes we miss the forest for the trees. If we are, at least, aware of the idea of Meta we put ourselves at increased odds of not missing the forest. How often have you taken the time to think about your thinking? Everyday we get caught up and caught in the daily minutiae. If we never stop to take a birds eye view from what we are thinking in moment-by-moment plays we risk missing the point. We risk missing what we are ultimately trying achieve. We risk missing the actions required for things we truly want. And we risk missing out on becoming what we want to be. One of the first places that I learnt about Meta thinking was in a small Yoga studio in the outer suburbs of Melbourne. After 30 minutes of awkward twisting and bending. I found myself lying on the mat. Breathing deeply. And thinking about the spiritual essence of the moment. My background is in engineering. So the idea of something so esoteric as the “spiritual essence of the moment” threw me big time. But since that day, I have developed a relationship with “spirituality” that stems from being the moment. It isn’t necessarily talking about the existence of a deity, but from being more focused on the important things in the moment. And how this type of thinking can lead to a greater sense of calm and effectiveness. With an engineering mind “a greater sense of calm” doesn’t always sink in properly, but effectiveness goes straight the core. So when taking the idea of Meta and applying it to your thinking you can start to improve your thinking. And going back to the forest analogy, you stand a better chance of not getting caught up with one tree or another. If you are overwhelmed or distracted by one tree, it will keep you from being productive and effective. Taking the idea to the next step, you can start to think about your thinking when it comes to learning. Or a better definition, meta-learning is simply learning how to learn. 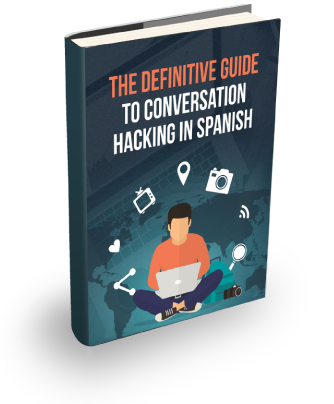 Say the goal is to be conversational in Spanish, have you taken the time to think about how you would achieve that? Have you looked back at how you have learnt something quickly in the past? Taking the time to consider how you best learn, or considering a journey of discovery for determining how you best learn is well worth the effort. This journey could be your best weapon for learning not just Spanish but anything quickly. When is the best time of day for you to learn: in the morning or in the evening? Are you a visual learner, a kinaesthetic learner or auditory learner? Do you work best under pressure or with no pressure? That last question is probably a trick; we all work better without pressure. Some people say that they are last minute people. Myself included. But what I have learnt is usually they just haven’t discovered other strategies and tactics to avoid procrastination and find focus. Or in other words they haven’t taking the time to learn how they learn best. Maybe that’s something they wanted to leave to the last minute. How important would it be to discover your best method for learning? Once you discover your best strategy for learning effectively, what else could you learn, achieve or do? There are some strategies that are universal when it comes to meta-learning such as focusing on one task at a time and staying the moment. But there are other things that we all respond to differently such visual stimuli or auditory stimuli. Your job as a language hacker is to determine how you personally learn best. This is so you can cut your the learning curve by significant time and effort. The result of meta-analysis and learning breads the idea of conversation hacking. Conversation hacking is a way of cutting through the trees and seeing the forest. It is about understanding that if you want to learn Spanish fast, you need to think about what that means. If you want to learn Spanish fast do you really mean you want to fluent? Or you just want to be able to hold a conversation? Are these two things the same for you? For me, holding a conversation and fluency are completely different things. But when students say that want to learn Spanish it often just means conversational. My experience has been that most students just want to able to speak. It’s not that they want to work as a highly skilled translator who can simultaneous take one language in and speak another one out. Or be able to translate books or large passages of complicated texts from one language to another. My observations are that most students just want to be able to converse. This is enough to have amazing experiences in countries where they didn’t used to speak the language. Would you like to have an ability in Spanish where you can not only ask for directions but be able to sit down with a local and discuss their world views? Being able to experience the perspectives of people on the other side of the world in a language you didn’t used to understand is an experience that I can’t beat. Conversation hacking is then taking this idea as an end game. And then breaking down the requirements in to its component parts to get there as fast as possible. This idea of breaking down the end game is the first principle of conversation hacking. And if you want be good quickly, you must first consider the end game. You must first see the forest. If you can successfully see the forest you have what it takes to learn Spanish fast.